Nothing sounds better than sitting back, relaxing, and taking a nice deep breath of cool air. However, falling leaves and the smell of Pumpkin Spice Lattes are not the only thing traveling through the air. Flu season is just around the corner! While that might sound a little scary, there are some easy ways to know if you are getting sick, and how to prevent this nasty little virus. This is not something to take lightly, after all, the Center for Disease Control and Prevention (CDC) estimate 5 percent to 20 percent (= 10 million) of the U.S. population gets the flu, tens of thousands are hospitalized and thousands die from flu-related illness. Do you really want to take the risk? 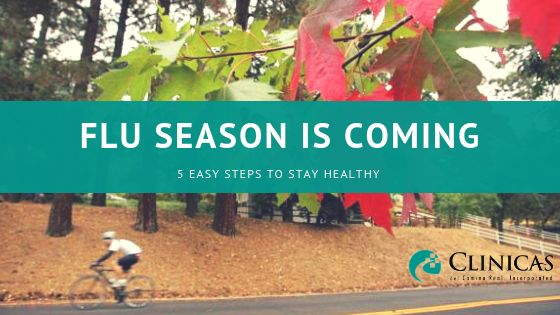 The CDC recommends that everyone receive their flu shot by the end of October as flu activity is common in the fall and winter months, but peaks during December through February. It can be difficult to know whether you have the flu or just a cold because they have similar symptoms and are both respiratory illnesses. Typically, the flu is worse than a cold because the symptoms are more intense and appear suddenly. Colds usually come on slowly and last longer. Colds do not result in serious medical conditions whereas the flu can result in sinus and ear infections as a moderate complication. A more serious complication from flu is pneumonia, which requires medical attention. If your flu symptoms don’t subside after a couple of days, antiviral drugs can be prescribed to lessen the illness by one to two days. Wash your hands often with soap and warm water. If water is not available, use an alcohol-based rub, such as hand sanitizer. Cover your nose and mouth when you sneeze/cough. This will stop the spread of germs from getting into the air. Limit your exposure to sick or infected people. If you are the person infected, limit contact with anyone else as well. Clean and disinfect surfaces and objects (cell phone, door handles, keyboards) that may have been contaminated with the virus. GET YOUR FLU SHOT. Taking the time to get your flu vaccine is the most important step you can take to ensuring you do not become sick. If you’re in the Ventura County area suffering from a cold or the flu, visit Clinicas del Camino Real, Inc.! We are a community health center that offers a quality, cost-effective care alternative to meet your unscheduled needs. See Our Locations. If you would like to learn more about the CDC, click here to visit their website.